The home stay in Marek, which is last but one village to the boarder with China. 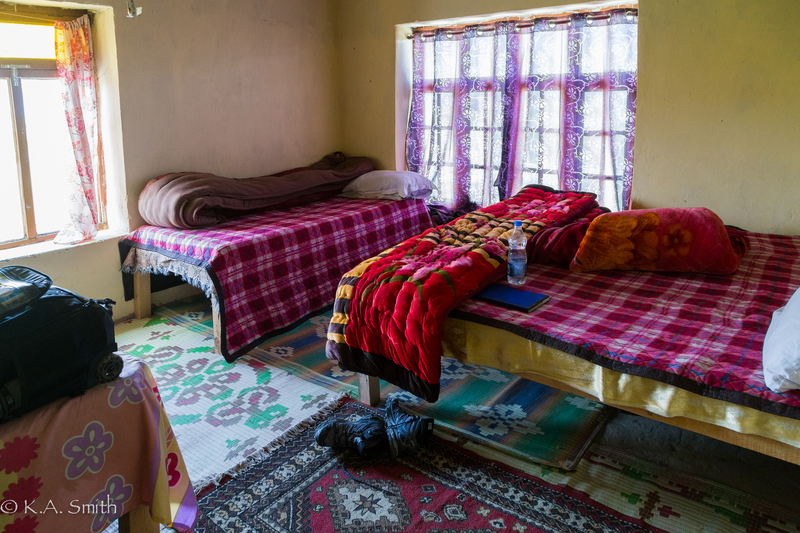 I’m sitting in the local Tibetan doctor’s house in Marek, the last but one village on Pangong Lake – about 30 km. from the Chinese border. An extraordinary spot – tranquil, ethereal and moving to an altogether different tempo. The doctor’s house is also a home stay, so we arrived 11:30 ish from where we stayed last night.Tsering and I walked the first 6 km, not the entire distance! I felt pretty good about the walk actually but was very pleased to see Dorjee and the car pulled over at the side of the track waiting for us! I looked over at Tsering at one point and he’s ambling along not even slightly out of breath – bugger! Then I did one of those mental “corrections” – “OK Kim, one – he is exactly half your age, two – he grew up at 4000 + m. so his lungs work better than yours ever will, three – he doesn’t have a rattling chest cold and four – I don’t care! The incoming drizzle certainly helped decide it was time to ride the rest of the way anyway. The Amchi, upon hearing me trying to regurgitate my lungs, immediately brewed up an herbal potion for me – a kind of reddish, brown concoction which was a bit astringent but not unpleasant. Little did I know that each subsequent dose would get exponentially stronger until everyone was in hysterics watching me force the vile stuff down! 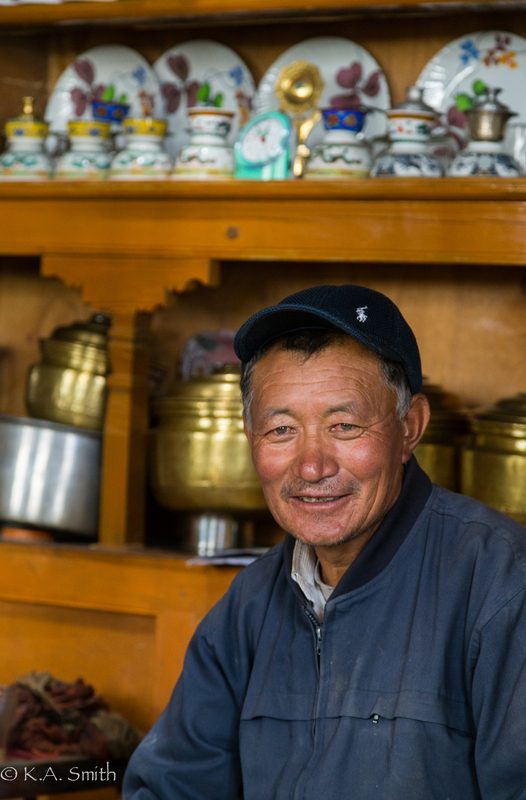 This is my host in Marek and the village Tibetan Medicine man called the Amchi. Then I was given sweet (OMG sweet!) milk tea, two cups of butter tea (which I really like and it is certainly a much needed energy and caloric boost) and homemade momos for lunch ably thrown together by Dashi, the lady of the house. I chopped onions and Tsering very competently formed the dumplings – a hidden talent and one which seemed to tickle our hosts – that the guests would help out I think. In the picture below by the way – that is the kitchen – its a bit of a corner in the main part of the house – you just squat down on the floor and have at it. Actual cooking is done perched up on a rickety shelf with a single burner propane flame! Nap time – I seem to need them – altitude I think plus the chest congestion. We then went for a walk around the village – like many places I’ve been lately there were the very old and the very young. 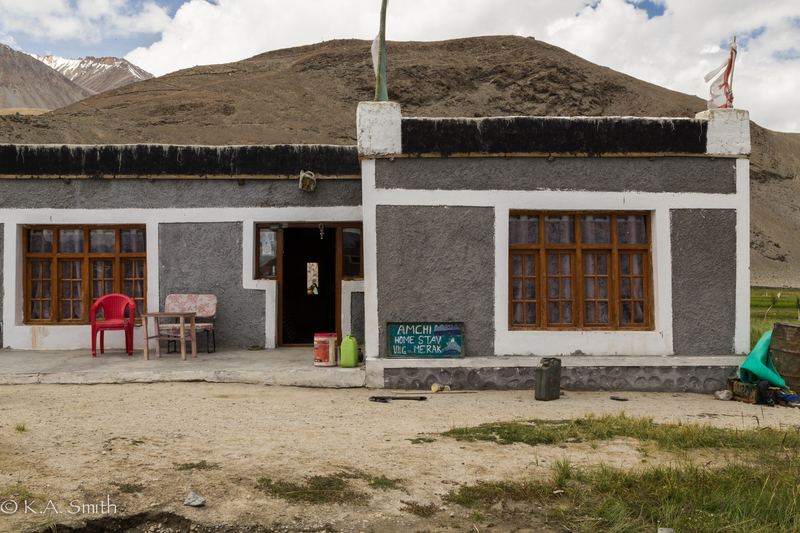 It seems the kids go off to Leh to be educated and then don’t want to return to these isolated places with no real job prospects – not really a surprise I suppose. I spent twenty minutes or so playing with a little bull calf which was fun – sat down on the grass and he practically climbed into my lap. Not a dog or cat but adorable none the less! 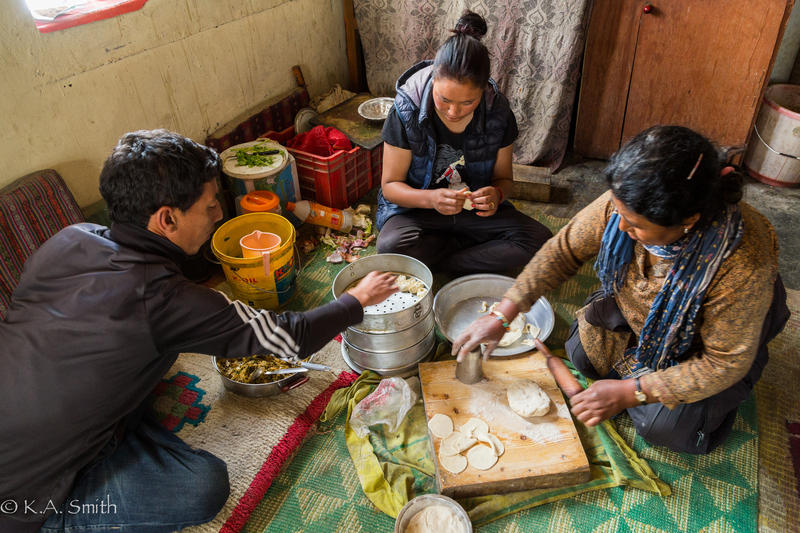 Dashi, Tsering and one of the daughters getting down to the business of making MoMos – the best I have ever had! Our soporific calm has just been invaded by a half dozen young Koreans – four long pale, pretty girls and two Laurel and Hardy boys. We are all sitting on the porch, drinking tea, watching the drivers wash the cars and then themselves – in icy cold glacial run-off BRRRR! 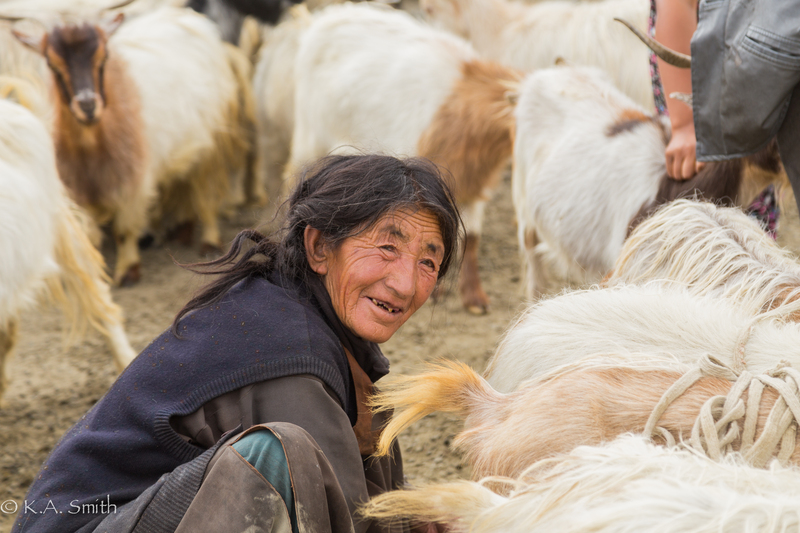 Whats highly entertaining (from my “vast” years and let me tell you – watching these kids makes me feel every single one of those years) is watching the girls watching the guys and the boys watching the girls watching the guys….Tsering has become quite bashful! Fancy that! The Koreans have brought all their own food which they insist on cooking on an outdoor bonfire. They seem rather nonplussed that they have to pay extra for the wood – but then if they actually looked around instead of taking selfies all the time – they’d realize there are NO trees here so firewood is just a LITTLE rare. Their charm is wearing off quite quickly I must say! I’m not photographing them because they are so busy with their selfies that they don’t actually “see” anything, they aren’t experiencing anything new and wonderful and are REALLY irritating! I have developed an absolute abhorrence of the selfie taking, stick waving tourist and their endless posing/poser positioning. One more pouty lip, hip thrust or “V” and I might just run amok! Next Morning – I’m really upset and sad. Somewhere around here I have lost my black swan signet ring! I’ve turned everything upside down hunting for it but I suspect it must have slipped off last evening when we went down to the lake to watch the sunset. Oh dear – I have had that ring for more than thirty years and it was one of the very first “real” jewellery purchases I ever made. Thats what you get for loosing weight and like a complete idiot I had had the thought that it was getting too loose for that left baby finger and perhaps I should switch to the right – bugger!!! OK so part of this two year journey is to loosen the hold things and stuff have on me – fair enough but this one hurts…. Sometimes life really does make sure you learn the things you NEED to learn. I am also trying to learn to catch on a bit more quickly so I don’t get slapped in the face more than is strictly necessary! 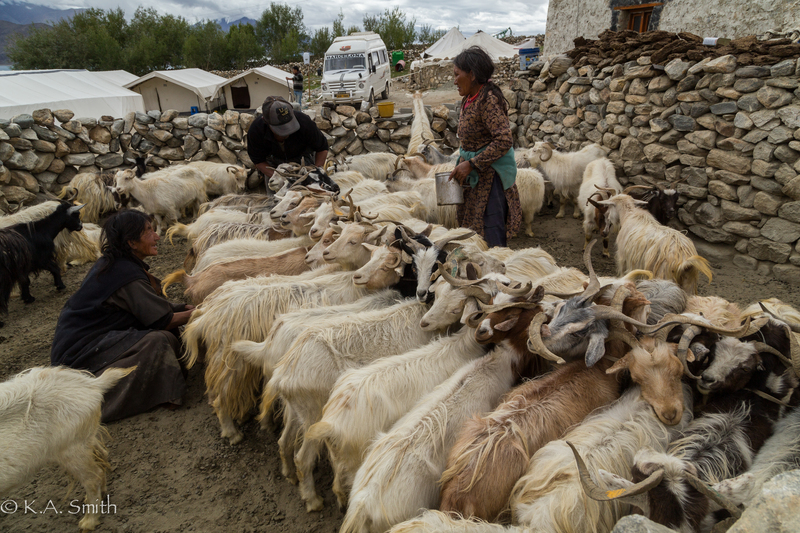 This entry was posted in India 2015, Ladakh, Stories and tagged Marek. Bookmark the permalink. Dear Kim, let’s found the club of “No More Selfies” or “Stick your stick up your bl..y a..!” Hate them too. So sad about your ring – yes, I also am aware, it’s attachment to non-essential things, but some things are just essential for the soul, and grieving is allowed. I can sympathize. Your room looked pretty comfie! Too bad about the ring. Those precious and meaningful items are indeed ‘priceless’ But as Leesa says, It’s the meaning, much more than the ring.